From 9 am to 3 pm, this awesome event will feature FREE workshops for both new and experienced gardeners. 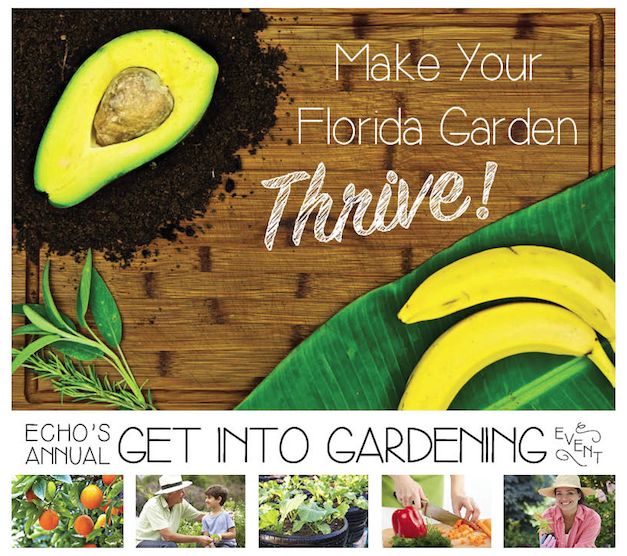 Take part in tropical gardening workshops such as Gardening in SW Florida, Container Gardening, What’s the Buzzz?, Tropical Fruit Grafting, Growing Tips for the Home Gardener, The Basics of Building with Bamboo, Bokashi, and more. Our regularly scheduled guided tour of ECHO's Global Demonstration Farm will also be available at 9:30 am, 10:30 am, 11:30 am, and 12:30 pm. We woke to the light of morning shining through the leaves of papaya and avocado trees next to the A-Frame on ECHO’s farm. As we sauntered to the second level to toast bagels and sip coffee, the heat of a Florida November had already begun to rustle the tips of the bamboo shoots nearby. At our home, Bethel University in St. Paul, Minn., the leaves are already off the trees. But at ECHO Farm, everything is alive. We, four students from a small journalism program, had never heard of silvopastoral systems or sustainable agroforestry. We came to ECHO as learners - and we learned. More than anything, we learned how much we don’t know about our world and those who hunger in it. We met agriculturalists from Australia, Haiti and Brazil, as well as from all over the U.S.
For the short visit we had at the ECHO conference we had one goal: find stories and serve others by sharing these stories. We quickly came to realize our plan wasn’t so simple. One person in particular who caught our attention introduced himself to us as Michel. Traveling from Haiti, Michel and his friend David offered to be in the video we were producing for ECHO - a small project intended to get a sense of why ECHO matters to the people it affects. Michel translated for David, who spoke Haitian Creole. We sat back in awe while the lilting tones of the Haitian language bounced back and forth through the ECHO yard. We came to serve ECHO, but the people of ECHO continually served us. After talking to several people about their experiences with ECHO, we came across one vibrant woman. She pulled aside the brown, wooden rocking chair we had been using and plopped down while she ate from a bag of popcorn in her hand. She smiled up at us struck a conversation. We asked her if we could interview her about what ECHO means to her. “My husband and I founded ECHO,” she said with a chuckle. We spent the next twenty minutes listening and learning from Bonnie Price and the experiences she and her husband have shared. We spent the rest of the afternoon traipsing past the sheep, being followed by the local cat and enjoying the balmy air of Fort Myers. We learned that the guacamole we ate for lunch was made from a recipe created by a neurosurgeon. We learned how to make an agroforestry joke. Mostly, we closed our mouths and learned. What a blessing it is to learn. What a blessing it is to serve our fellow children of God. How humbling it is to meet the hands and feet of Christ at ECHO.